We go to Tunis to see how women are making sure there's a place for them behind the decks. There's a party at the ambassador's residence. People are schmoozing with drinks in hand and head bopping to electronic music. DJ Alpha, who plays a mix of Afro, pop and deep house, is on the decks with dark nail polish and a studded leather jacket. Next to her are three young women intently watching her hands and nodding their heads. I wonder if they feel the same inspiration I felt when I looked at her. The next day is International Women's Day and the crowd at Yüka—a mass of curls and smiles—sways in synch to the beat. The woman behind the decks turns up the tempo and the crowd jumps. The front row cheers their support as sweat fills the room–the sure sign of a good dance night. I'm struck by the intensity in the space, the sheer love of music and the weird little community that has seemingly spawned itself right there on the dance floor. I couldn't have imagined it, but it was exactly what I had been hoping for from the moment I landed in Tunisia. From day one–cruising along the coast, my field of vision a blur of pristine white trimmed with that unique, Tunisian cerulean blue–a melody of French and Arabic drummed in my ears, fostering a growing excitement for what was to come. 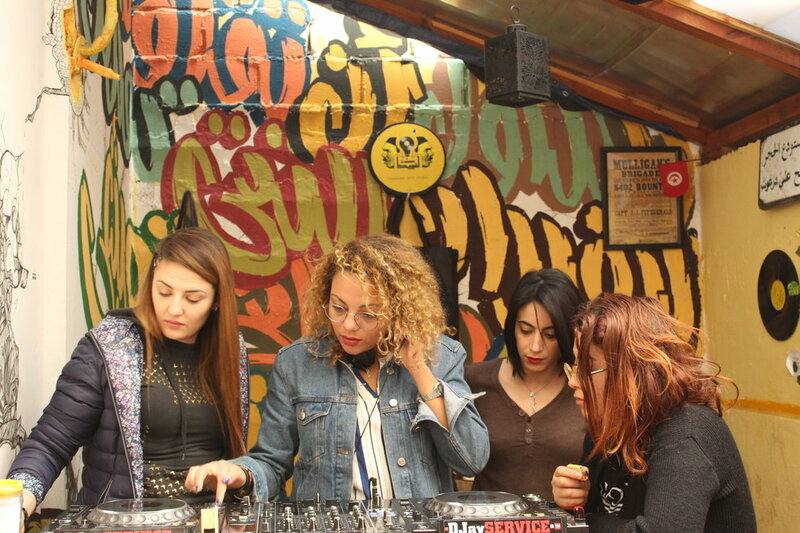 I was there to follow the creators of a new, all-female DJ Academy as they put the final touches on a week-long, all-female DJ workshop—the first of its kind in the region. The DJ Academy is the result of a partnership between La Fabrique (a coworking art studio for cultural collaboration in the heart of Tunis) and Future Female Sounds (a Danish non-profit organization and booking agency that strives to empower girls through sound and action). Both entities are founded and run by women: Olfa Arfaoui for La Fabrique and Tia Korpe for Future Female Sounds. Olfa has long been involved with human rights and representation while Tia is a professional DJ and retired emcee with an extensive history in music as activism. 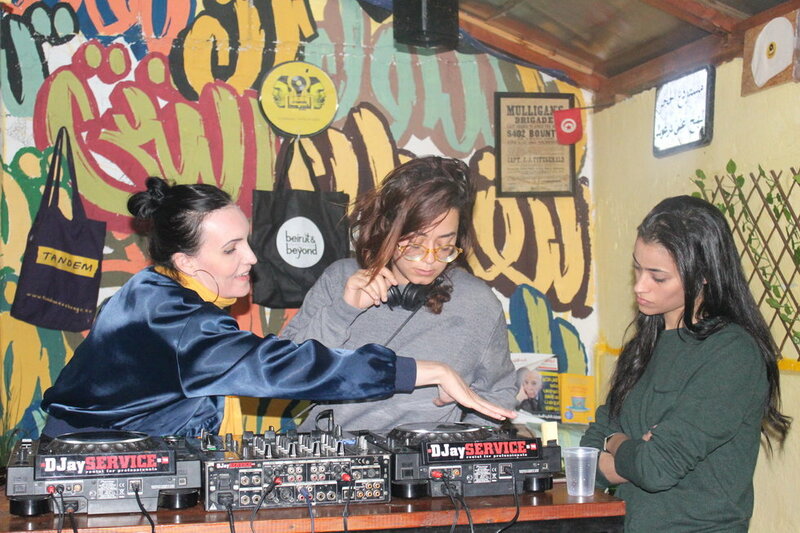 I was along for the ride to survey the scene, take in the sights and witness how an all-female DJ community could come to be in the North African city. Tia Korpe instructs one of the workshop participants at La Fabrique while Noy Ära looks on. Photo by Nneka Mogbo/La Fabrique. But why Tunis? Why now? Well, after serving as the catalyst for the Arab Spring and its waves of protests and well-placed indignation, Tunis has had an artistic and cultural renaissance. Today, the city boasts a unique environment where artists of all forms can find a receptive and eager audience for new ideas. "Before the revolution, people wanted more mainstream music. Now they want more discovery–they want to be shown something new. That's where the DJ comes in and the space has shifted," Noy Ära tells me as I drench a piece of bread in Tunisian olive oil at BeyRoom, a restaurant in Grammarth. Noy Ära is a local DJ, deep in the electronic scene, and the other instructor of the workshop besides Tia. Her comment is reflective of the state of Tunis itself. What was okay then is not necessarily what's okay now. The people of Tunis are busy answering the question of who they are, what they want and how they want it. While international chart topper after international chart topper may have been cool before—and still is—now, people want to hear something a bit more self-expressive. As Tia tells me, "When you're in a room with music, something can happen. It's a cliché but it is a binding factor for social relations between people. Once you understand what a DJ does, it's not just putting on a song and you dance—it's taking people on a journey, mentally and spiritually. Music is very powerful within itself and I think that when a woman creates a playlist or creates music, there is a different and special vibe that comes out of that. 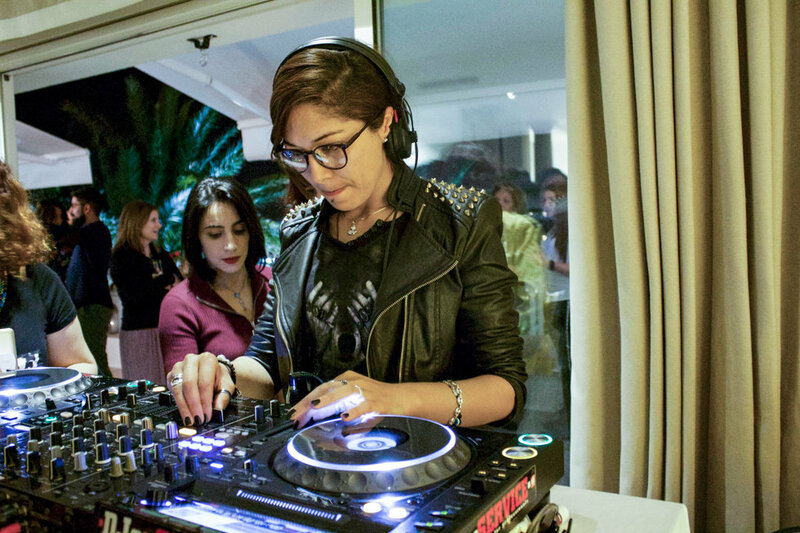 And, if you look at the whole region, Tunisia is actually like the number one in terms of producing female DJs." DJ Alpha trying out her set at the residence for the ambassador to the European Union. Photo by Nneka Mogbo/La Fabrique. Hence the birth of this partnership: representation with a musical lean. Watching Tia and Olfa interact, you would never guess that they had met one another in person just a few days before I arrived. They work in sync, driven by a mutual respect and a strong desire to see this project made real. When I ask how they found each other, Tia tells me that a friend in the Tunis music scene told her about a woman who held an event for female DJs. Tia wrote to the woman and that woman was Olfa. It turned out that Olfa had already found Future Female Sounds on Facebook. "She was like 'Oh, but it's you. I already know you.' As soon as I sent her a message," Tia recalls. Even in today's global world of acutely connected communities, I feel like this really underlines the notion that a global network of working females in the music industry is aching to happen and, once the avenue is given, the connections are readily made. People don't want to only 'like and subscribe'. I think Olfa put it best when introducing the Academy at its first public event: "This academy—the workshops, the party, the networking—it all comes down to one vision: we just want to create a positive impact through music and concrete actions." For their first plan of action, they've designed an intensive 7-day training to teach multiple facets of DJing: how to set up equipment, creating libraries, how to work with sound, EQ, BPM, self-promotion, branding, management, working with bookers and more. And, of course, practice, practice, practice. The week culminates in a live performance at Yüka, a beach-front venue with a female booker, with mini-sets from all the workshop participants capped off by a two-hour back to back from workshop instructors Tia and Noy Ära. It's an ambitious program and, while driving from one meeting to another, Tia, Olfa and I start to chat about the goal of the Academy as a whole. It is very clear both Tia and Olfa want this to last, not just as a one-off event—but as the base for something much bigger, longer lasting. Four workshop participants explore the decks together as they learn about mixing necessities such as cueing, EQing and BPM. Photo by Nneka Mogbo/La Fabrique. "My hopes are for all the girls to have learnt and understood what DJing is, that they gain the technical skills to be able to continue to DJ and that they feel that they are part of a new community. I want to create a space that isn't about competition, but about starting a crew. Because this is also about building self-esteem. You know, helping girls dare to do it so that they feel stronger than before. Not only in terms of skills, but also personally. For me, that's the most important outcome," says Tia. Olfa chimes in right after with, "I really want the women to feel empowered. We created this series of events to give people the feeling that they have the power to negotiate. Because it also opens up a new source of income and living. Of course, we also want to shift the narrative, change mindsets a little. There is a huge barrier for women to enter the nightlife—there's a lack of safe spaces. Transportation. And gender norms are very set." Hearing this, it reminds me of the chat I'd had with Noy Ära over the heavenly olive oil. She'd been explaining to me that one of the hardest things for her as a DJ was to be bold enough to negotiate with bookers and promoters. Plus, knowing you're going to be traveling alone at night a lot can be tough. She mentioned strength being one of the most important characters for a female DJ, especially in Tunis. "For me, I've always felt really encouraged from the beginning. So I can't say that there is a negativity in the DJ scene for females—at least in electronic music, where I'm focused. Maybe that's one of the things that makes Tunis special. But what excites me is making this community and what it will do for the nightlife of the city and how women move through it." It seems that the interest is present in Tunis, the open-mindedness towards females in less traditional fields, but it lacks the actual infrastructure. Without that sort of avenue, there is nowhere for this open-mindedness to catch on. Despite any best attempts at changing minds, it's necessary that people can see that change in action. It's necessary that Tunisians have a way to see women doing new things—otherwise changes stay theoretical, and theory ain't change. As Olfa says, "I feel like often times someone's talent is being undermined depending on who they are. I want to do something about that." The start of that is to create a safe space – a place for women to hone their skills in the presence of others doing the same. 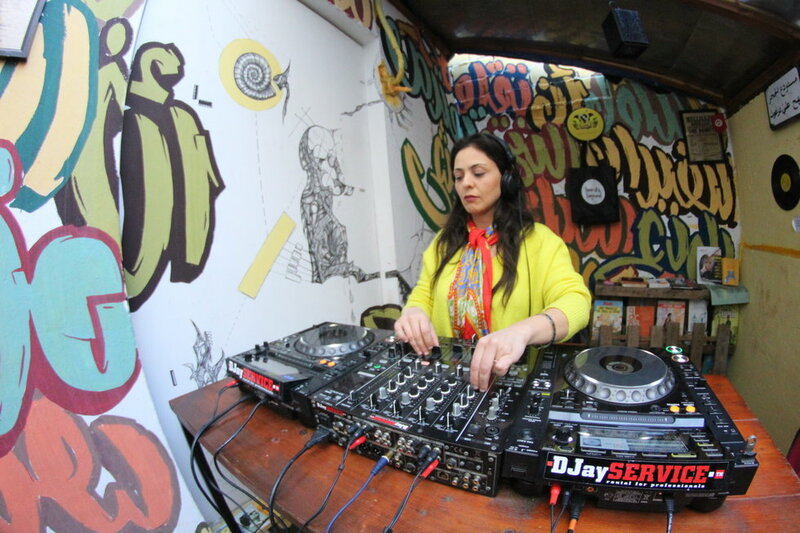 Founder Olfa Arfaoui trying her hands on the decks as DJ Yin Kin. Photo by Nneka Mogbo/La Fabrique. Globally, this is a trend. There is a demand for safe spaces based on religion, sexual orientation gender identity, race, you name it—and the general idea is that it provides an environment where people feel allowed to be themselves, to taste the freedom that comes with being a majority. "I think it's important to note something that is a common misconception about things that have a feminist agenda or are focused on women," says Tia. "We don't do this because we don't like men. We like men very much. But we've noticed there is a different ambiance and learning curve when it is just women." This DJ Academy believes in the power and the impact of the dimension women's voices can bring to Tunisia's sculpting and shaping of herself. It believes in the importance of women's stories and perspectives in the collective identity on a national and international level. In fact, this Academy and this workshop is the first step in many–for instance a tour throughout the region with DJs from multiple countries is in the works for later this year. When I ask if other countries have signed on or shown interest, Tia gives me a sly smile and a little shrug. Which I read as yes, so stay tuned. As I shadow Tia and Olfa while they secure everything for the workshop, it's evident that they're not simply putting together a dope event – they are laying down a foundation for change. It isn't about getting a great venue, it's about finding a great venue that supports their vision. It isn't about getting publicity, it's about consciously and deliberately building a network. It isn't about getting attention, it's about demanding respect. When I realize this, I'm reminded of a quote from the drummer Ahmir "Questlove" Thompson. The quote is from deep in a conversation he had with Alec Baldwin about how The Roots made a space for themselves in the industry at a time when their sound wasn't popular: "No one has ever had success in music without being contextualized in an artistic community. So you think you like Stevie Wonder, but, it's like no—you associate Stevie Wonder with Smokey, The Temptations, Diana Ross and the Supremes, the Motown Family...The only people that had success without a family or contextualization were one-hit wonders." Olfa and Tia are actively trying to create a—a global movement—for females within the music industry and in DJing specifically. Like Questlove and his crew saw when building The Roots, these women see the need for a foundation for female DJs within its own artistic frame of reference, within its own context. It looks like Tunis might just be HQ. Find Nereya barely posting but always loitering on her Instagram.